Please note: I saw the premiere of this production for free on the courtesy of Tampereen Työväen Teatteri. A musical about the Addams family is a concept that seems like it's got a lot of potential, and a show I would love to like. They're creepy, they're spooky, and they're a lot of fun. With catchy tunes and a compelling plot, this should be good. 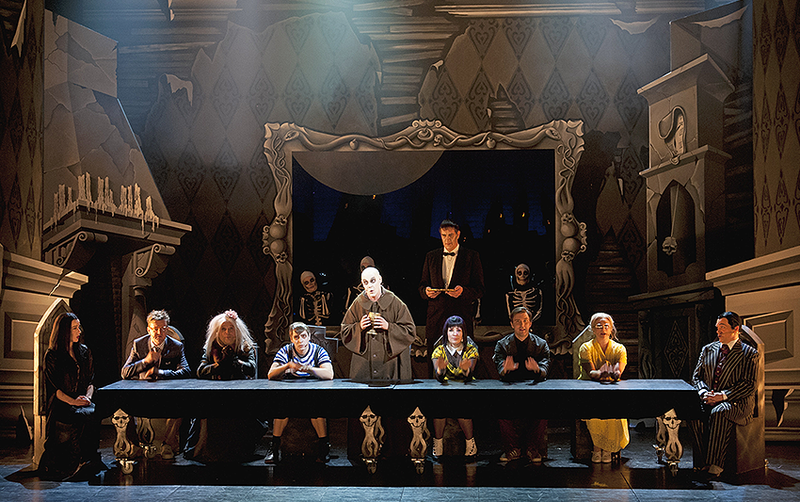 Sadly, having just seen the show at Tampereen Työväen Teatteri, I can tell you catchy tunes and a compelling plot are the two things The Addams Family the musical simply doesn't have. The Addams Family tells a story about a grown-up Wednesday Addams bringing her fiancé and his parents to meet her family. But – gasp – the love of Wednesday's life, Lucas, is a normal guy with a normal family. His parents don't live in a freaky mansion full of torture devices and undead butlers. And now the two families will meet each other for the first time. Hijinks will certainly ensue! At first, they do. In the first act there are quite a lot of funny jokes about the situation. I admit, I laughed... During the second act, however, the plot (written by Marshall Brickman and Rick Elice) comes to a halt. The musical doesn't take full advantage of its premise. I got the feeling the show is afraid of overdoing the joke about the Addams versus Normal People, and almost underdoes it instead. The groom's family gets used to their new inlaws too fast and easily, the issue gets buried deep under unrelated problems by the second act. The structure of the show is awful: it runs out of interesting plot points before the intermission already. The second half of the show is then spent on filler events and filler songs. I might have been able to forgive the filler songs if they were good. Too bad they're not. To me, the catchiest, most interesting of Andrew Lippa's tunes were the act overtures and some of the music playing under dialogue scenes. No classic showtune material here, just an uninteresting song after another with a couple of mildly pleasant surprises in between. Apparently the characters are supposed to have different styles of music associated to them. Maybe that's why the score doesn't feel like a whole, even though it's a bit hard to tell which character is supposed to have which style of music. 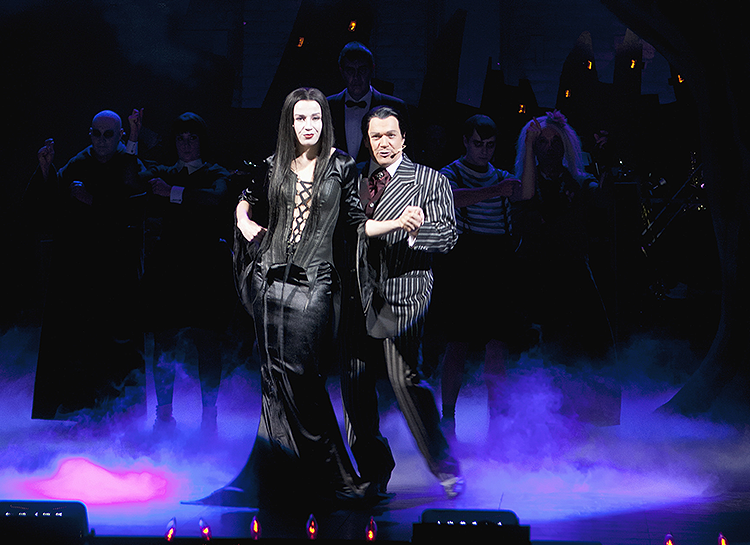 Luckily the Addams family themselves are a lot of fun. Eriikka Väliahde is a gorgeous Morticia (how does she even move in her costume without toppling over?) with delicious acting and Puntti Valtonen is a symphatetic Gomez. Their scenes together were the highlights of the premiere. Laura Alajääski, Wednesday, has some serious singing talent. And I have to mention Sami Eerola as Lurch, too – according to Wikipedia, he's the second-tallest man in Finland, and as such a very chilling sight in the role! But indeed the differences in between the two families in this show run deep: to prevent the audience from having too much fun, the groom and his folks are quite bland. Lucas is a cute guy that doesn't have a soul, a prop rather than a person. That can't be blamed on Juha-Matti Koskela, who I'm sure does his best in the part – there simply aren't any interesting scenes or songs to work with. I found the groom's parents (Mika Honkanen and Minna Hokkanen) unpleasant. The plot's sudden focus on them during the second act felt annoying at best. All in all, the cast of Tampereen Työväen Teatteri's production of The Addams Family does a nice job, and the sets and costumes look cute. But no amount of talent available can save the script or the monotone that is the music. It's a shame the writers of this show couldn't create an exciting musical about the Addams family. With proper script and catchier tunes, this could have been a fun night at the theatre.